Are You Responsible for a Business ? 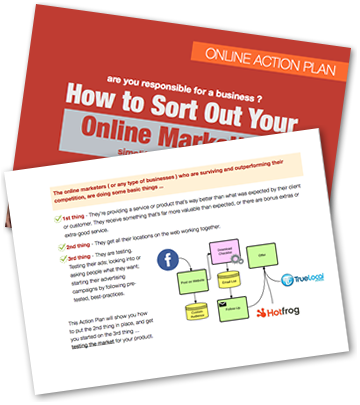 Need to Sort Out Your Online Marketing ? and need to get started, but don’t have time to stuff around. I hang onto your email address, but I don't pass it to anyone else. How to use a business Facebook page and your website together so you get somewhere. A good way to monitor your spending. It's actually not too hard to develop online-marketing for a business if you have a blueprint. This checklist is simple, walks you through basic steps and will get you much faster results than trying to work it out yourself. I’d like to let you know that I’m NOT a famous internet marketer and prefer to keep a low profile but I’ve been handling online marketing since 2003 and this action plan shows 2 basic things I do to get things off the ground. So remove the confusion and put something in place that works. Learn heaps about your potential customers and clients. Find out about what your clients and customers want and what to say to them in your promotion. Get a marketing strategy in place and how to get Facebook and your website working together. Make sure you’re getting value for your buck. This shows you what we do to monitor promotion costs. This is free and there is no obligation of any kind. I’m offering it because if you find it useful, you might like our help handling some parts for you. With 2015 half-done, it’s worth getting going sooner rather than later. Not having online marketing in place these days is losing you business and money.